Valvoline crimson heavy duty grease is a tacky extreme pressure lithium soap grease designed specifically for the commercial fleet environment. It provides excellent performance over a variety of operating conditions and is dyed red for easy identification. Valvoline crimson grease contains select extreme pressure additives to protect and lubricate during heavy shock loading periods and is fortified with oxidation and corrosion inhibitors for long service life. Excellent resistance to water wash-out. 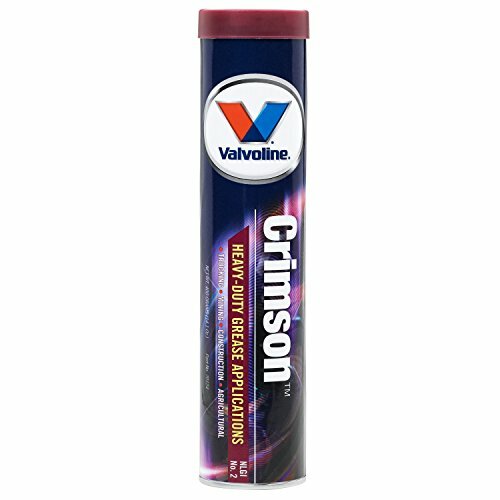 Valvoline crimson heavy duty grease (Red Lithium 12-hydroxy) is a Red, tacky, extreme pressure, Lithium soap grease designed for a commercial fleet environment. Preferred for moderate load carrying capacities, pressure and temperature ranges. Nlgi 2 lb. 50% higher load wear protection versus lb requirement for extreme pressure. Fortified with oxidation and corrosion inhibitors for long service life.